I traveled to the picturesque region below the Krušné Mountains to see Osek Monastery in 2018. It was my second visit in eight years. I remembered shivering with cold as I wore my rather thin jacket during that first visit, probably in October of 2010. Feeling partially frozen, I waited patiently for the bus back to Prague after a wonderful tour. I had enjoyed my time there immensely, but what I remember most is the cold that seeped through my garments. It was July when I came back for another look at the Cistercian monastery that was founded in the early 13th century, though monks had called the area home even at the end of the 12th century. This time, I arrived by car with a friend. The Church of Our Lady at the monastery was a Romanesque creation, built as a three-aisled basilica in the shape of a Latin cross. The chapels and choir are rectangular. Measuring 76 meters long, during Romanesque days it was the biggest monasterial church in Bohemia. 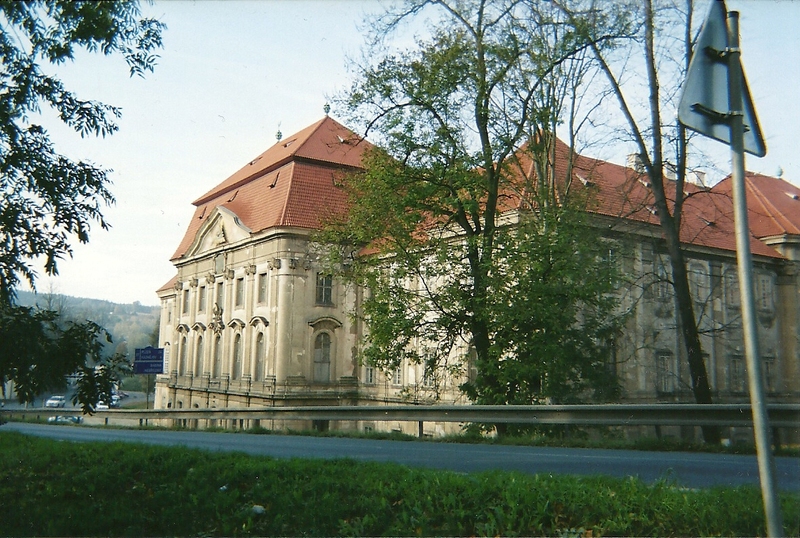 The monastery was damaged during the Hussite wars of the 15th century during two years. The Hussites detested the Cistercians because, among other reasons, they were the wealthiest order in the Czech lands. The Thirty Years’ War brought devastation to the holy place. From 1580 to 1628, the monastery was closed. In the early 18th century, the Abbot Benedict Littweig ordered Baroque reconstruction. Two cupolas, the façade, sculptural ornamentation and the main altar all hail from that time period. The main architect of the makeover was an Italian born in Bohemia, Octavian Broggio from the Litoměřice region. He favored radical Baroque style and had experience working in Prague and in the area where he was born. 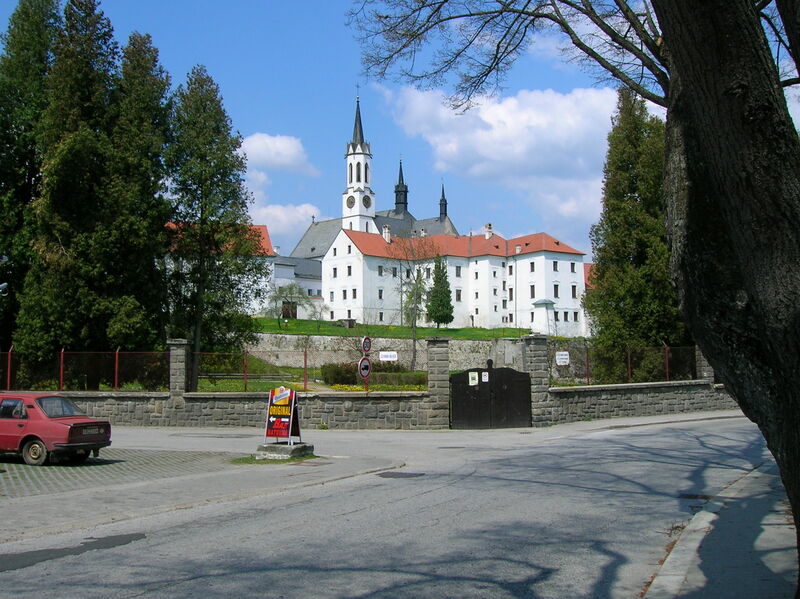 During 1945 and 1946, the German monks who were living there were resettled in Germany for a while, and during 1961, they were sent to Germany again. At one point, the Salesians lived there, but the order was closed in 1950. The year 1950 would be the beginning of dreadful times. 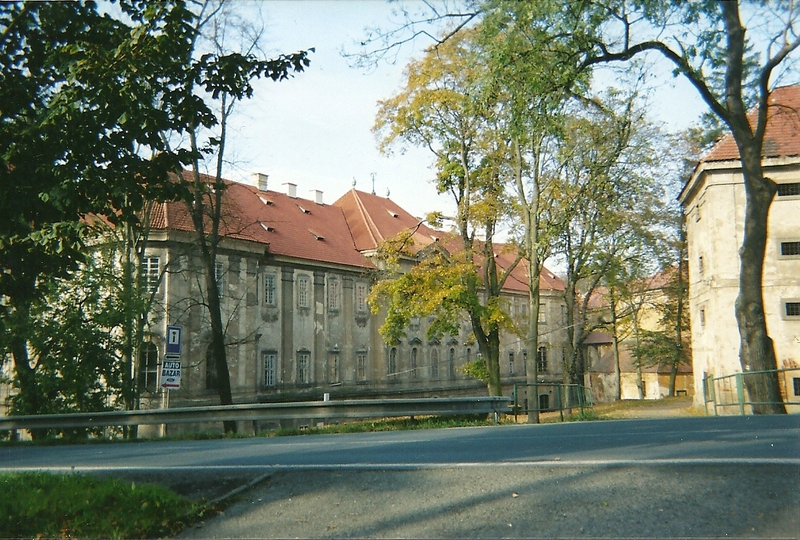 From 1950 to 1953, the monastery was used a detention center for priests. After that, it became a detention center for nuns. The Cistercian monks reclaimed the property in 1991 and left in 2010, when Abbot Bernard Thebej, who had overseen the monastery from 1991, died. I waited for the tour as I gazed at the Baroque façade with a superb portico. Saints John, Mark, Luke and Matouš faced me. I saw Saints Peter and Paul above them. I thought of the other Cistercian monasteries I had visited. In south Bohemia, I had seen both Vyšší Brod and Zlatá Koruna. At Vyšší Brod, I was most enamored by the library of 70,000 volumes, the third Czech monastic library. The Theological Hall with one of the largest collections of Bibles in Central Europe had also captivated me. I recalled the elaborate Rococo stucco decoration and numerous Rococo wall paintings at Zlatá Koruna as well as the early Gothic Chapel of Guardian Angels. Near Kutná Hora, not far from Prague, Sedlec Monastery had amazed me with its Santini-created Baroque Gothic style interior and paintings by Baroque master Petr Brandl. Plasy in west Bohemia also came to mind. Santini had done his magic there as well, and the Baroque pharmacy had such superbly painted drawers. I had toured Plasy at least three times. I had been impressed by Velehrad in Moravia, but I had been there so many, too many, years ago. The guide took us inside. The superb interior was pure Baroque with much stucco ornamentation. I was particularly drawn to one side altar because of its extremely morbid character. The altar featured Christ on the Cross, flanked by two angels, but the ornamentation made it feel creepy. It was adorned with figures of skulls and bones in Classicist style. At the foot of the Cross, there was a golden skull. I recalled the Cycle of Death murals at Kuks, a former hospital in splendid Baroque style. I had visited it on several occasions, so I was well-versed with the Baroque obsession for skeletons, skulls and bones. At the altar, there was a reliquary with remnants of Saint John the Baptist and other saints. All the chapels were impressive, but this one especially caught my attention. There were two Baroque cupolas. I saw painted windows on one – a trademark of the Baroque style. Two Baroque organs graced the church. One of them had 666 pedals, giving it a mystical quality. The choir benches – Baroque, of course – were amazing, made with intarsia decoration of wood on wood. The inlays were breathtaking. Black spiral columns and gold ornamentation added to the Baroque ambience. The guide opened a cabinet behind a bench: Hymnbooks were stored there. I could imagine the Cistercian monks singing in celebration and could almost hear their voices resound through the church. In front of the choir, there were modern benches where services were currently held. Facing these benches, underneath the floor, was the tomb of the last abbot. The main altar included impressive sculptures of the four apostles. Figures of angels also had prominent roles in the adornment. The painting of Assumption of Our Lady – the patron saint of the Cistercians – was the work of Jan Krištof Liška, a truly remarkable Czech artist. Václav Vavřinec Reiner, whose monumental painting I had seen at Duchcov Chateau a few months earlier, was responsible for the painting of the side altars as was Michael Leopold Willmann. Reiner also had created, along with Jan Jakub Steinfels, the ceiling paintings in the main nave and chancel. They portrayed scenes from the life of Christ and from the Old Testament. The cloister surrounds a garden that is decorated with three tombstones from the 14th to 16th centuries. Eighteenth century paintings promoting the history of the order are features of the cloister. I could see Romanesque traits in the entrance portal to the cloister from the church. We passed by Well Chapel. A well, the monks’ source of water for a lengthy period, was the central element of the chapel, as the name suggests. Sculptural decoration adorned the well. On the wall behind it, there was a bright orange sliver of glass. This piece was original, dating back to the Gothic era. At that time, the glass had been brightly colored. The Chapter Hall was a Gothic delight. Constructed from 1225 to 1250, it was one of the first Gothic buildings in the Czech lands. The sandstone sculptures from this era were impressive. A Gothic statue of the Madonna hails from around 1430. Monks had frequented this area every day. In the middle of a room was a reader’s lectern from which monks would read aloud to those gathered in the space. A Gothic mechanism allowed the top of the lectern to swivel from side to side. In the chapel, the altar looked a bit flamboyant for late Gothic, with white and gold decoration. The wall paintings illustrating the history of the order were newer, dating from 1750. Near the entranceway to the chapter hall was a dog’s paw print. I wondered what kind of dog had made the imprint and if the dog had lived during the Gothic period or Baroque era. I loved that the monastery’s architecture celebrated both spectacular Baroque and Gothic styles. After the tour, my friend and I found a busy restaurant with outside tables, where we had delicious food. The establishment seemed to be the popular place for lunch in the town. Our stomachs filled with a satisfying lunch, we headed back to Prague. I had learned during the tour that the monastery would soon be closing for three years to have the entire interior renovated. I felt lucky I had had the chance to visit before the renovation and knew I had to come back in three years, to see an even more superb Baroque and Gothic creation. While staying in the picturesque southern Bohemian town of Český Krumlov, I took a day trip to the nearby Cistercian monastery Vyšší Brod, located in the town by the same name and nestled in the Šumava mountains region. Now once again the property of the Cistercian Order, the monastery, founded in 1259 and built over a period of 100 years, still retains a Gothic appearance with features of both Early and Late Gothic architecture, as I noticed upon my arrival. First, I stepped into the church itself and especially took note of the high altar and the side altar of the Virgin Mary. Built from 1644 to 1646, the Early Baroque high altar is made of brown gilded wood. I loved how it was adorned with statues, such as those of Saint Eugene the Pope and Saint Bernard. A sculpture of the Crowning of the Virgin Mary and another of the Holy Trinity also impressed me. The side altar of the Virgin Mary boasted a valuable panel painting of the Madonna of Vyšší Brod by the Master of Vyšší Brod sometime after 1400. Set against a golden background, the blond Mother of God cradled a naked baby Jesus while angels hovered above her and saints posed at the sides. Then there were the abbots’ tombstones, some in Mannerist style and others from the Baroque era I also saw the wood inlaid and gilded choir studded with Baroque statues of various saints. A glance upwards and I was looking at exquisite Gothic stained glass windows decorated with themes from the lives of saints. An art lover, I was enthusiastic to see the monastery’s art collection. Mostly Gothic and Baroque, it featured many Dutch and Flemish works (yes!) as well as Baroque creations by Czech artists such as Petr Brandl (one of the Baroque painters I hold dearest!). Baroque seascapes and landscapes by Norbert Grund and František Xavier Palko’s rendition of the 12 apostles and a portrait by Czech master Jan Kupecký were among the dazzling canvases in the exhibition. I especially liked Grund’s landscapes. Soon it was time to visit the library, which held 70,000 volumes, making it the third largest Czech monastic library. Only Strahov and Teplá boasted more books. I set my eyes on Rococo bookcases dating from 1756. Works from 1500 to 1800 made up part of the collection, though some pieces dated as far back as the 13th century. A five-volume Latin Bible also caught my attention. It hailed from the early 14th century. Chants of the Cistercian Order were written at the turn of the 15th century. Then our group came to the Library Corridor, which is home to 19th century and early 20th century collections written mostly in Latin and German. We moved on to the Philosophical Hall where books about such subjects as math, biology, and chemistry as well as German dictionaries are stored. The astounding fresco on the ceiling was the work of Lukáš Vávra. Latin quotations by Saint Bernard promoting education could be seen above the windows. In the center of the room I was blown away by a detailed map of the Czech lands that featured even the tiniest villages from the 1600s. I was awed by the attention to detail. The Theological Hall was best known for keeping one of the largest collections of bibles in Central Europe, and the holy books in the collection come in 40 languages. Can you believe it? The white pigskin bindings hailed from the middle of the 18th century. Another fresco by Vávra adorned the ceiling, this one showing a 12-year old Jesus in a temple. The guide pointed out something intriguing about the painting. If you look closely, you notice that some of the things featured in the fresco didn’t exist when Jesus was alive. For example, one man donned glasses, another held a book, and there was glass in a window. The style of clothing and the architecture were also ahead of their time. Then the tour ended. On the main square in the town, only steps away from the monastery, I found a restaurant in a hotel where I was able to have my favorite chicken with peaches and cheese. Then I stood across the street, waiting for the bus back to Český Krumlov, but it seemed that I had the wrong information. It would be another two hours before a bus came along, according to the schedule at the stop. I spent another hour in the restaurant, downing Viennese-style coffee and glasses of nonsparkling water and then stood at the bus stop for a while on that nice, though crisp, day. I let my mind wander and just succumbed to the feeling of happiness that overwhelmed me. Tracy A. Burns is a proofreader, writer and editor in Prague.